The following ornaments have been decorated with light weight spackle. Among the many new crafting mediums I've tried this year, this happens to be my favorite because of how versatile it is. 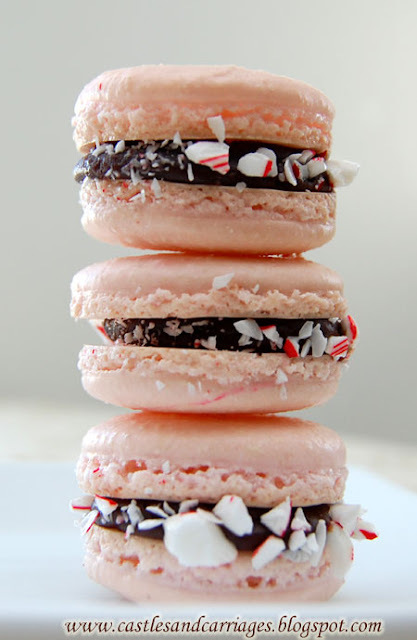 If you take a look at all the things you can do with real frosting, you can do it with spackle. The great thing is, after you take the time to make it, you can keep it forever. 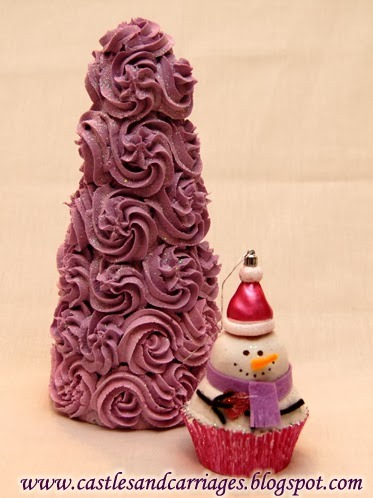 Last year, I spent quite a bit of time making these frosting trees. My gingerbread house was gigantic (though it doesn't look like it) . It was a two story house and those trees were large. I've heard that you can keep royal icing forever as long as it's in a cool, dry place yada yada but I don't want to worry about that. Had I known about the spackle back then, that's what I would have made it out of so I could have kept them without any worry of humidity/mold/bugs. What you will need is to make sure you have plastic gloves and a workspace in a well-ventilated area. 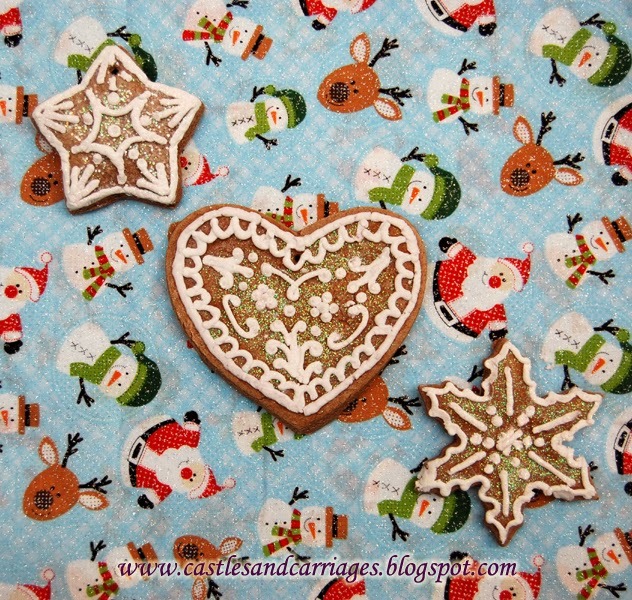 The ornaments that I will be showing you how to make are snowman cupcake ornaments, cookie ornaments and frosting trees. Are you ready to get your crafting on? Well, scroll on down. Cake Tips: Large star (as shown above) for both the giant cupcake and small regular sized cupcake. Glorious Treats shows a beautiful chart for what designs each cake tip creates. Acrylic Craft Paint (this will be your frosting color. Remember that the lightweight spackle is white so you can choose a darker color paint because it will lighten when you mix it). Light Weight Spackle (available at your local hardware store or Walmart). Put on your plastic gloves and put a few drops into your lightweight spackle container. Mix well (I use a plastic spoon/knife) until you've reached your desired shade of color. 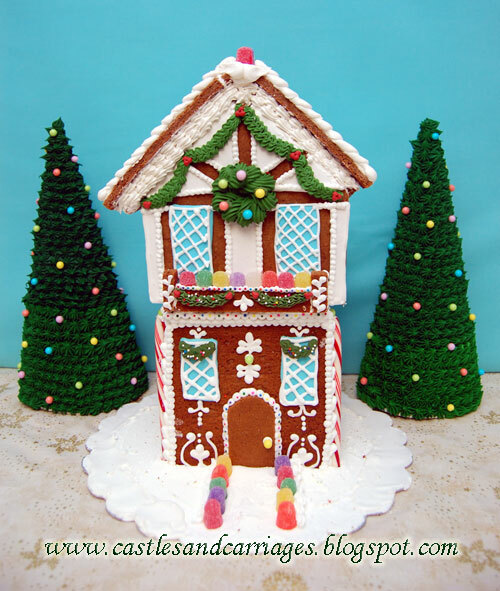 Keep in mind that you probably won't be able to make dark colored "frosting" because the paint will make the spackle more runny if you use too much. Put your cake tip into your pastry bag and spoon the colored spackle in. Smear some spackle onto the top half of your styrofoam ball so the spackle can adhere to it. Put the excess into a ziploc bag so you can use the spackle container to put your styrofoam ball in. Glue your styrofoam ball into the spackle container. 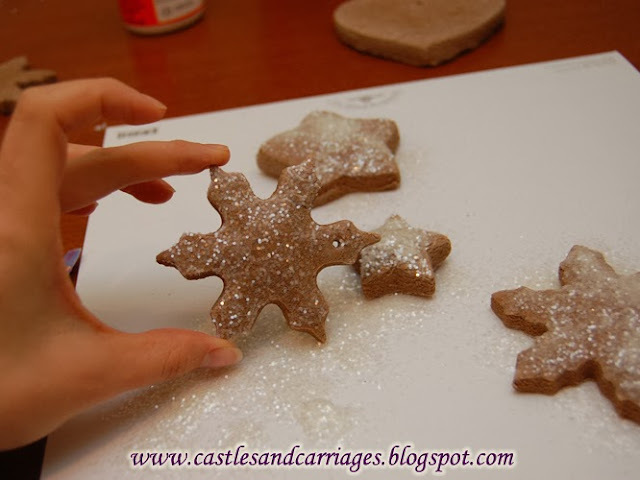 Take your glitter paper and cut it to fit the outside of your container. Glue it on. Add whatever embellishments you choose. 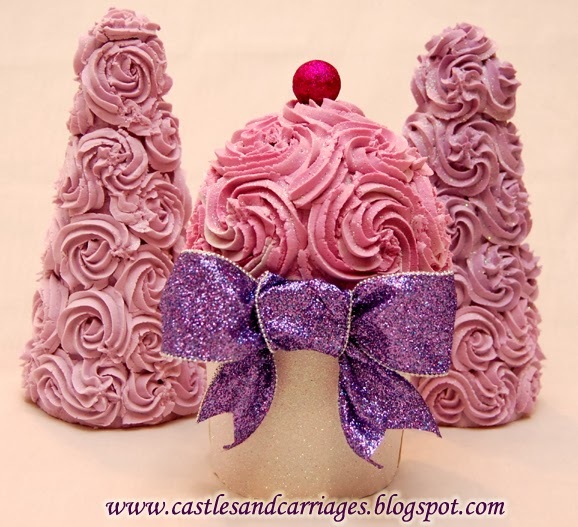 I had some pretty purple glittered ribbon to place in front of my cupcake. 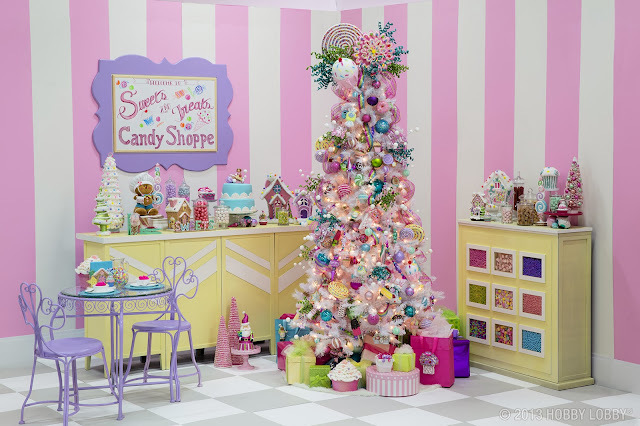 I've seen little faux candies put on the frosting trees that are super adorable. 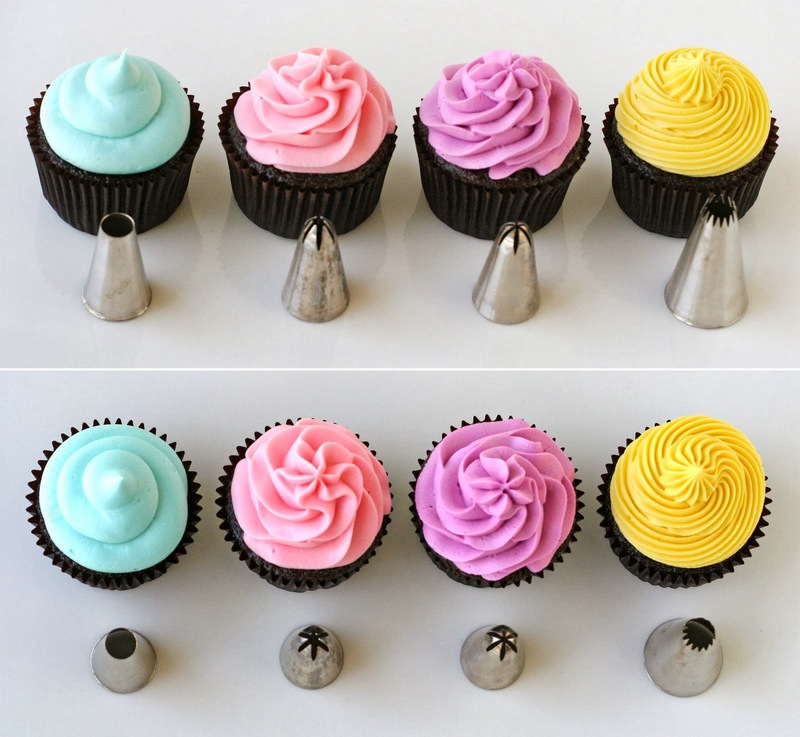 If you're interested in making a more regular sized cupcake, Megan from Bright So Slight has the best tutorial on how to do it. Hop on over to her blog to see how it's done. 2. Mix flour, salt and cinnamon together. 3. Add 1/2 of water and then maybe only a few tablespoons at a time until your dough has a playdough like consistency. 4. Roll out dough to 1/4" thick and cut with cookie cutters. 5. Carefully place on cookie sheet and bake for 250 degrees for 2 hours. 6. 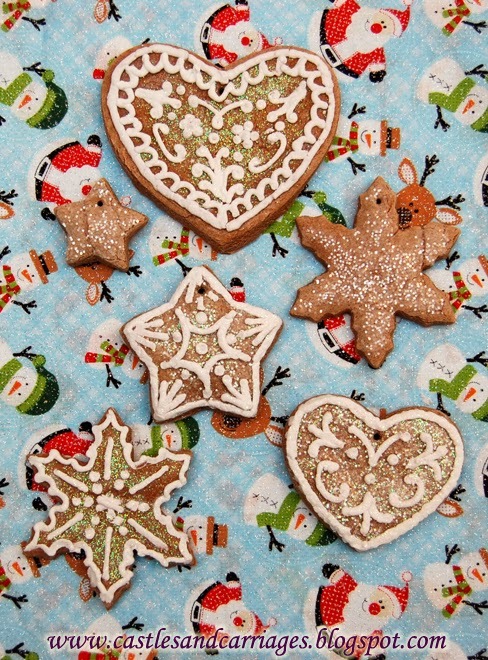 Allow cookies to cook completely before adding any embellishments. 7. 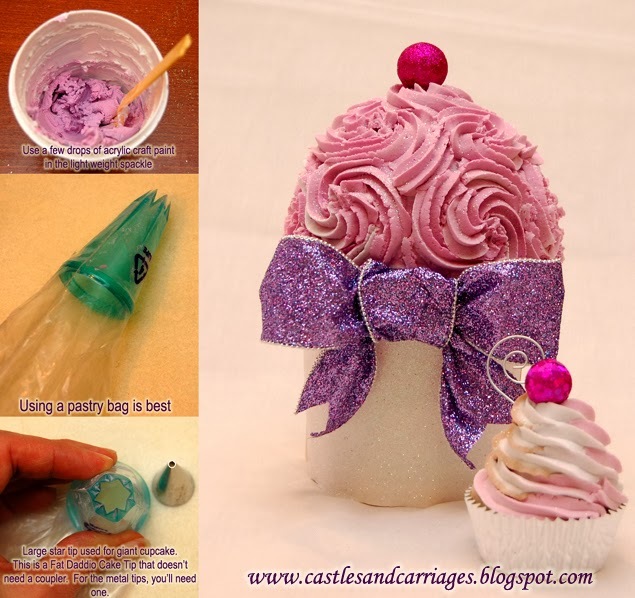 Place your cake tip of choice into your pastry bag and fill with spackle. 8. Paint ModgePodge onto your cookies and then pipe on spackle and sprinkle with glitter before spackle dries. Don't shake off excess glitter till spackle dries.